The government of Rwanda has announced it will no longer allow individuals and non-governmental organizations to directly file complaints against it with the African Court on Human and Peoples’ Rights (AfCHPR). [Ministry of Justice Press Release] The decision comes as the African Court is set to decide a claim against Rwanda by a leading opposition politician, Victoire Ingabire, who alleges her imprisonment for genocide denial was unfair and politically motivated. [AfCHPR Press Release; HRW] Rwanda deposited the withdrawal on February 29, just over three years after it first deposited the declaration under Article 34(6) of the Protocol to the African Charter on Human and Peoples’ Rights. The government asserts that the withdrawal is intended to prevent exploitation of the individual complaint procedure by criminals, particularly individuals who took part in the 1994 genocide and have subsequently fled the country. [Ministry of Justice Press Release] The Protocol does not outline a withdrawal process, and the Court has yet to make a decision on the validity of the withdrawal or how it will affect pending cases against Rwanda. Only eight African Union (AU) countries have submitted declarations allowing individual complaints to the Court, and Rwanda is the only State to withdraw, potentially reducing the number of AU countries where individuals and NGOs have direct access to the Court to seven. Local news sources frame the issue as relating to the case of Stanley Safari, a former Rwandan senator who was found guilty and sentenced to life in prison by a Gacaca court on many counts of murders of ethnic Tutsis during the 1994 genocide, but he escaped and fled the country before the trial was over. [New Times; ISS Africa] However, Safari’s claim is not included in the Court’s list of pending cases. 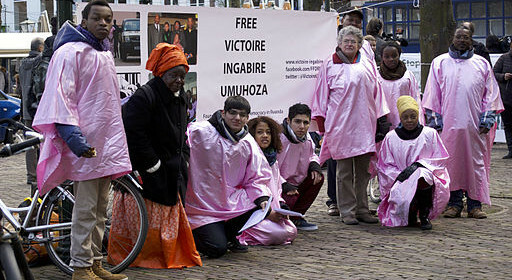 Ms. Ingabire submitted her complaint to the African Court in October of 2014, alleging violations of her rights to a fair hearing, freedom of expression, and equal protection under three human rights treaties: the Universal Declaration of Human Rights, the African Charter on Human and Peoples’ Rights, and the International Covenant on Civil and Political Rights. 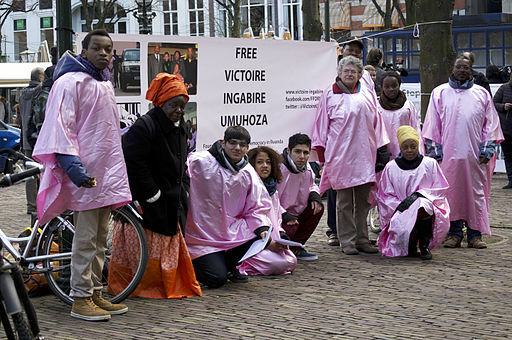 She also asks that the Court order Rwanda to review her case, repeal with retroactive effect the specific laws under which she was convicted, annul all the decisions that had been made against her since the preliminary investigation up until her sentencing, and demand her release on parole. See AfCHPR, Application No. 003/2014, Ingabire Victoire Umuhoza v. The Republic of Rwanda, Case Summary, paras. 13 and 14. The government alleges that Ms. Ingabire failed to exhaust domestic remedies and that all of her rights were respected throughout the process of her arrest and trial. Id. at paras. 15-19. In determining whether to move forward with Ms. Ingabire’s case, the African Court will have to decide if Rwanda’s withdrawal is valid. Neither the African Charter on Human and Peoples’ Rights nor the Protocol to the African Charter contain a provision on denunciation, and, therefore, whereas the European Convention on Human Rights allows States to withdraw after six months’ notice under Article 58 and the American Convention on Human Rights requires one year’s notice under Article 78, no such procedure currently exists with regard to the African Court’s jurisdiction. The 1956 Vienna Convention on the Law of Treaties, to which Rwanda acceded in 1980, provides under Article 56 that treaties that do not contain a denunciation clause are not subject to denunciation or withdrawal unless it is established that the parties intended to admit this possibility or the nature of the treaty implies a right of denunciation of withdrawal. Rwanda is reportedly not seeking to withdraw from the entire treaty, but only aiming to limit the direct access of individuals to the Court. [Ministry of Justice Press Release] States accept the African Court’s jurisdiction over individual and group complaints by submitting a separate declaration; governments can accept the Court’s jurisdiction – by ratifying the Protocol to the African Charter – without authorizing it to hear individual and group communications. Regardless, the African Court may also hear cases involving individual complaints against State parties to the Protocol when they are referred to the Court by the African Commission on Human and Peoples’ Rights. For more information about the African Human Rights System or the African Court on Human and Peoples’ Rights, visit IJRC’s Online Resource Hub.